Indiana Jones and the Kingdom of the Crystal Skull (2008) Steven Spielberg. 122 min. *I just read (20110618) the first few lines to the corresponding Wikipedia page and I feel they might reveal too much. 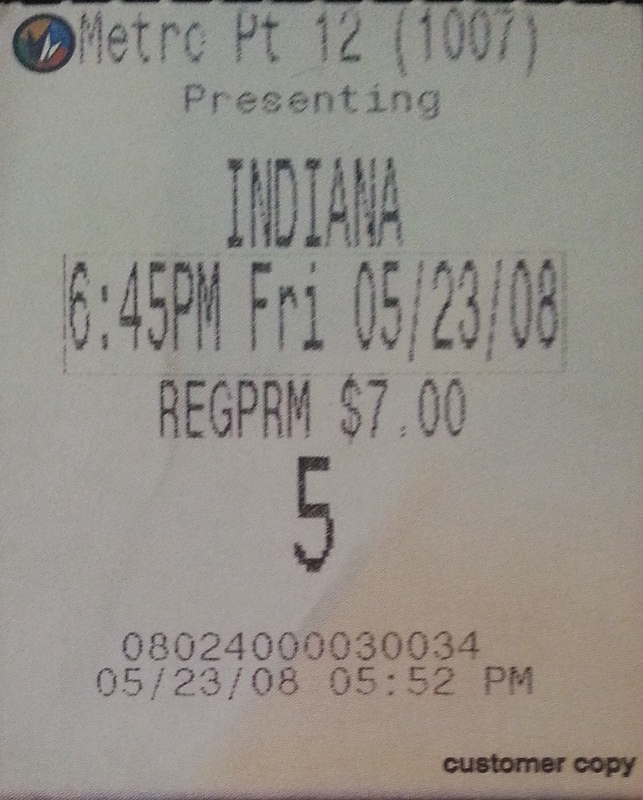 I recall liking most of the movie, but not the ending and various parts related to the ending. I don't mean the very ending; I mean the ending of the climax, where the audience learns the answer to the mystery. I knew enough about Indiana Jones to understand various references about Indy. I think I've seen all of the first one, Raiders of the Lost Ark (1981) through, but my memory is fuzzy. I'm sure I've seen bits and parts of the other Indiana Jones movies as well, but don't recall watching any of the other ones in full. I plan to watch them all soon enough. Perhaps make it a marathon. Karen Allen also played Marion in Raiders of the Lost Ark. 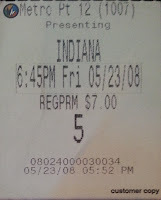 I almost got around to checking out the first three Indy movies from the library. I'll either have to borrow my friend's copies or wait until I have access to the library again. In any case, my dad came home from work and my sister and I finished watching Enchanted (2007) so I put on Kingdom of the Crystal Skull for him. I was only partially paying attention to the movie, trying instead on completing blog posts. The movies take place in 1936, 1935, 1938, and 1957 and were made in 1981, 1984, 1989, and 2008, respectively. As such, Harrison Ford's physical appearance is reasonably accounted for by the character's timeline. I make these two statements in response to a comment made during the warehouse action scene about how Ford being too old for such action. I think I enjoy the entire ending much better than I did watching it the first time in theaters. I don't know about most people, but I liked Kingdom of the Crystal Skull. It might not have had the same adventure and mood as the first movie, but there's quite a bit of fun and interesting grand-scale action sequences. If anything, it's existence has nostalgic purposes. Something new, and yet something old and familiar. Overall, I can see how the movie isn't always exciting and doesn't make a great movie, but it's decent . On the plus side, perhaps this movie being decent will allow the fifth movie to be awesome. I'm a glass half-full sort of guy. : Sean Connery's picture at 27 minutes. : Oh, my sister asked about why there were so many people with biker jackets on, I wasn't paying attention at the time, but on watching the scene with attention on 20110618, I realized there were basically two factions sitting in the cafe. There's also a bunch of bikes parked outside. : 1 hr 53 min, "Junior." "Somewhere your grandpa is laughing." Hahahaha. This HISHE (How It Should Have Ended) doesn't quite suggest how the movie should have ended, rather pokes fun at the fact that it was made. I like how Shia LeBeouf is holding a script to Blade Runner 2.